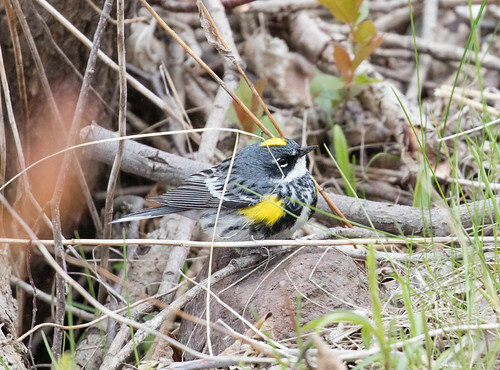 Laura's Birding Blog: Doubling the number of warbler species! This morning it was still cold enough that I kept my gloves on for our whole spring warbler walk. The trees are still pretty bare and most of our shorebird and songbird migrants are still south of here, but ducks and grebes have pretty much moved on and it was too cloudy for hawk migration, so we didn't quite reach the 40 species mark today that we did last week. We did add a few new birds: a House Wren singing away and a catbird skulking about, plus we had great looks at a few Nashville and Black-and-white Warblers (but no photos), and heard one Pine Warbler singing in the pine trees. So it was a lovely morning, even if we're all impatient for south winds to push more migrants our way. It feels weird to be this far into May with so few sparrows about. In my own yard, I had tree sparrows and juncos still on Monday, and I still have only a handful of White-throated Sparrows—no White-crowns, Harris’s, or Lincoln’s have shown up yet. But even though I'm sad that we haven't had many sparrows yet, I've been delighted, in my own yard and at the Western Waterfront Trail, to see and hear so many Song Sparrows this year. Today they weren't singing so much—we're guessing they must be busy with nesting behaviors now. But a couple of them gave me some nice photo-ops. 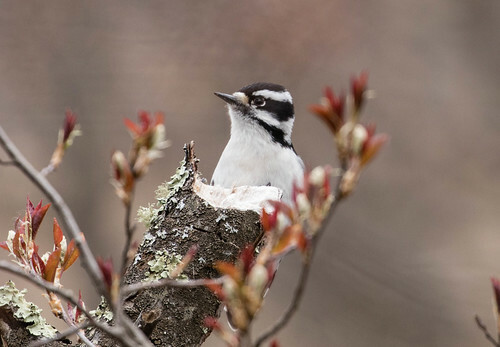 Downy and Hairy Woodpeckers have been pretty quiet—they’re probably busy with nesting, too—but we did spot a couple. White-breasted Nuthatches had been easy to find, with at least three different males singing on territories along our walk through last week, but they also seem to be busy with nesting now. We did spot one individual to bulk up our species list. Even as we got those few new warblers, the vast majority that we saw today, and the only ones that let me photograph them, were Yellow-rumps. I love them for their ubiquitousness, their dry chip (and how they often respond to my lame imitations! ), their delicately pretty little ditty, and especially for their beauty: both the soft elegance of the females, and the striking brilliance of the males. Plenty of Ruby-crowned Kinglets were flitting about and some were singing. They were all too active for photos, but everyone got good if quick looks at them. 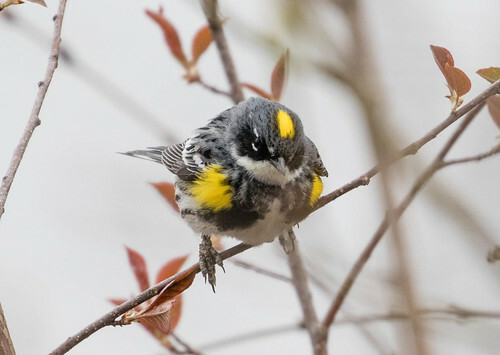 I'll miss them when they move on as more warblers move in, but that's part of the magic of spring migration. And meanwhile, despite the cool temperatures this morning, lots of tiny bugs were swarming about and the kinglets and yellow-rumps put on a great show fly-catching. In another week or so, real flycatchers will be taking over that gig. We lucked into another John Richardson sighting, running into this great birding guide about two-thirds of the way through our walk. We shared our information and saw some birds together. When he got ahead of us, he spotted a Northern Waterthrush—he was keeping on it until we caught up until some dog walkers scared it away and we missed it. He got ahead of us again, and found 11 Lesser Yellowlegs. This time the first of us to arrive saw them at a distance, and the stragglers got even better looks from closer range after we'd moseyed on. Yellowlegs were new for our Western Waterfront Trail walks this year. 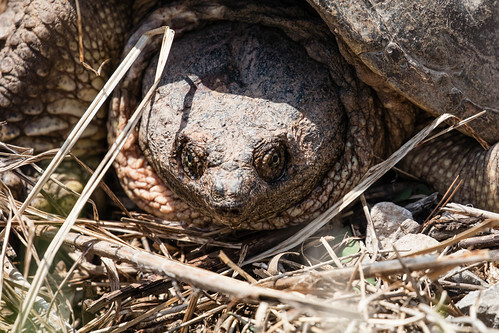 On Friday, my dog Pip and I saw several painted turtles and a huge snapping turtle at the Western Waterfront Trail. We didn't see any turtles today, but on the mammal scene we had gray and red squirrels and a most cooperative little chipmunk. In coming days the first hummingbirds, orioles, Rose-breasted Grosbeaks, and other cool birds will be turning up. I’m glad I started our warbler walks right at the start of April. 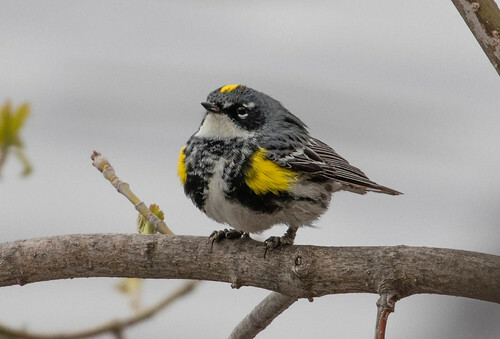 We’ve had lots of time to enjoy the early migration, and each time we spot something new for the year, which has happened on every one of our walks, we’ve had time to savor it. When things progress more quickly in the coming weeks, the birding pace will pick up. With luck, we’ll have some frenzied days where the birds are coming hot and heavy, but I still enjoy these more easy-going days. Loved this post. I'll share a little bit of the same, Ms. Erickson. Birdies of every kind are literally pouring into my neck of the woods in the western interior, Innoko River area of Alaska right now, too. Nests are being built, territories established and still more birds have yet to come. Our Yellow-Rumped warblers arrived May 8 and May 9th I noticed the beautiful sounds of Savannah Sparrows. Two years ago I married a new birding partner, Mr. Canon 7D Mark II. My beloved has introduced me to twice as many birds as I knew before my marriage! That Savannah Sparrow has become one of my favorites right along with our Yellow-rumped warbler. I don't know what it is but when you have a partner like Mr. Canon 7D Mark II the world has become more alive than I have ever known. I had no idea that of the birds I was gathering migratory data on for the last 15 years I had been missing at least 20 others! Yesterday on May 10, Global Big Day, I introduced my students to Savannah Sparrows. Getting children to sit still long enough to slow sounds down to individual songs is quite the challenge. 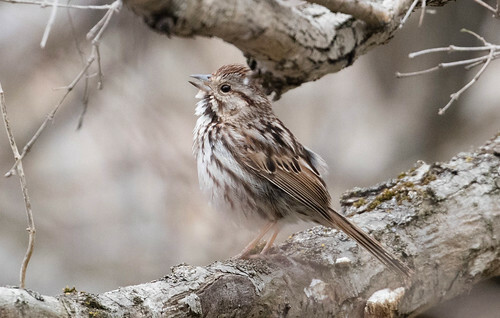 Once we established the sounds of the Rusty Blackbird and talked about its endangered status, marveled at the Wilson's Snipe's buffeting wings ("Rain Bird" in Deg Xinag) and told a traditional story about the bird, we tackled the songs of two White-crowned Sparrows (Mountain Bird in Deg Xinag). One of my favorite places to bird are away from our village at our airport. The tussox, grasses, shrub willows, meadow lands, low snow-melt puddles, this is one of the best places to watch and listen to birds. It's so easy to separate bird sounds in an open area. All my students know Raven's song (Yugatsee), but getting them tuned into Savannah Sparrows was a little more difficult. They are more camouflaged than Ravens or White-crowned Sparrows. They fly helter-skelter in the tall grass. Unless they are sitting tall and singing on the top of the grass they are hard to see. We just happened to see two of them fly into a grassy spot right in front of us. "Don't look!" my 6th grade boy student said, "They need some alone time!" Okaaaaay. 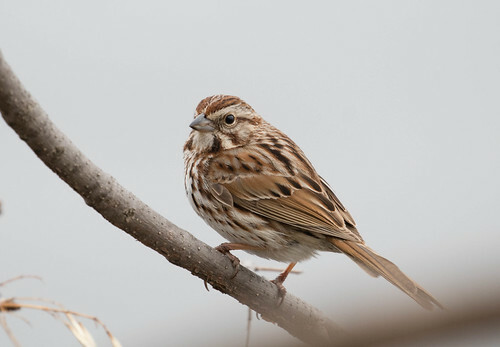 It was the best opportunity to LISTEN to Savannah Sparrows, observing their activity through the sunrised kissed grasses, lose sight of them, listening for their beautiful song and then catching sight of them again. We had a good Big Day birding, my students, my Canon and I.